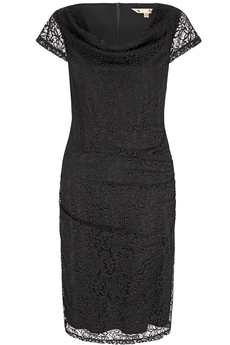 Yumi London, Floral Lace Cowl Neck dress is a lovely choice for formal occasions. Expertly crafted with from soft lace in a figure flattering silhouette, features cap-sleeves, cowl neckline and ruched side detailing. It is fully lined with elasticated fabric, has concealed back zip fastening and is 100cm in length. Winter collection. Composition: 100% Polyamide. Lining: 95% Viscose 5% Elastane. Color: Black.